No.1 fast DVD ripping solution to rip DVD/DVDISO image to mainstream videos including AVI, MP4, MPEG, WMV, MOV, FLV, 3GP, etc. By removing all DVD Copy Protections and region locks, this software makes all types of DVDs seamlessly compatible with iPhone/5, iPod/5, iPad/3/Mini, Apple TV, Mobile phone, Android, Surface, PSP, etc. The built-in DVD Copy feature empowers you to backup DVD to hard drive & USB, copy DVD to ISO image with original Video, original 5.1 Channel AC3/DTS Dolby Audio, as well as, backup DVD main content and title. First-rank DVD ripping and DVD backup software for Mac OS X. Bypass all copy protection system with ease, including DVD CSS, region code, RCE, Sony ArccOS, UOPs, Disney X-project DRM. Convert DVDs to MP4, H.264, MOV, FLV, iTunes videos for playback on Apple iPhone/5, iPad/3/Mini, iPod/5, Apple TV, Android, Surface, QuickTime Player or for further edition in iMovie, iLife, etc. Back up DVD to single MPEG-2 file with original Video and original 5.1-channel AC3/DTS Dolby audio. Support both PPC and Intel Mac. Ideal software to rip and sync Blu-ray DVD to iPhone (iPhone 3G, iPhone 3GS, iPhone 4, iPhone 4S, iPhone 5), iPod/5, iPad/3 and Apple TV. Based on High Quality Engine and advanced De-interlacing, it delivers remarkable image quality which is near original movie. The software comes prepared with sets of profiles to maximally simplify the ripping process. Solid DVD ripper software for Mac users to convert DVD to MP4, H.264 that are playable on iPhone (iPhone 3G, iPhone 3GS, iPhone 4, iPhone 4S, iPhone 5), iPod/5, iPad/3 and iTunes. With ready-made and professional profiles for each device, users could fulfill the ripping process with 3 mouse clicks while having the flexibility to personalize profiles as well. Smoothly play Blu-ray DVD movies on iPad/iPad 2/iPad 3/iPad Mini with this smart Blu-ray DVD iPad ripper software. It brings you uncompromised Blu-ray DVD ripping speed by fully supporting Multi-core CPU with advanced Blu-ray DVD decrypting system built in. Moreover, iPhone/5, iPod/5, Apple TV are also supported - versatile application for Apple fans and Blu-ray DVD movie fans. The name says it! This software is specially designed for ripping DVD to iPad under Mac OS so that you can watch DVD movies on iPad/3 without limitation, no matter limitation on format compatibility or copy protection. It benefits users by unbeatable DVD ripping speed, top output quality and easiness. It also supports iPhone/5, iPod/5 and Apple TV. All-in-one DVD to DVD copy software, designed to decrypt & backup DVD to DVD disc, DVD to ISO image, DVD to a single MPEG file with original video tracks and original AC3/DTS Dolby audio. It is featured with DVD title backup, video & audio extract. Support both homemade and encrypted DVDs, including newly Disney DVDs. Create self-made DVD is actually a piece of cake. With this DVD authoring software, you can painlessly convert and burn a wide range of videos to DVD, such as MKV, M2TS, M4V, MP4, AVI, WMV, H264, MPEG, RMVB, RM, MOV, ASF, etc. The internal versatile video editing tools let you make personalized DVD with DVD menu, chapter menu. A total region free/code free/zone free DVD player software. All DVD Copy Protections can be perfectly unlocked so that you won't miss any Hollywood blockbusters or Disney movies. Play DVD as well as regular videos AVI, Xvid, Divx, MP4, FLV, MPEG, WMV, ASF, RM, RMVB, etc, with superior picture quality and sharp audio performance. Almighty video software embedded with 210+ video audio codecs which makes it possible to convert almost all video formats available. Independently convert between MKV, AVCHD, M2TS, AVI, MPEG, MP4, H.264, MOV, WMV, Google TV, WebM, Vpx8, etc. Convert and transfer various videos to iPhone/5, iPad/3/Mini, iPod/5, Surface, PSP, PS3, Xbox, Android, Mobile phone, etc. Users can benefit from up to 15x real time converting speed and highest possible quality. 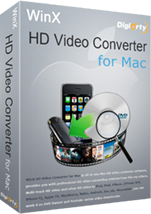 Feature-rich video converter software designed for Mac OS X, running with Intel Mac. Build in cutting-edge video encoding engine. Convert MKV, M2TS, AVCHD, H.264/MPEG-4 AVC, AVI, MPEG, MP4, MOV, FLV, RM, RMVB, WebM, Google TV to the videos accepted by Apple iPhone/5, iPad/3/Mini, iPod/5, Apple TV, Surface, QuickTime Player, iTunes, PSP, PS3, Zune, Xbox, Mobile phone, Android, etc. All video and audio parameters are customizable to blance video quality and file size. A complete solution for playback diverse videos on iPhone (iPhone 3G, iPhone 3GS, iPhone 4, iPhone 4S, iPhone 5) among popular HD videos MKV, AVCHD (MTS, M2TS), MOD, TS and regular videos AVI, MPEG, WMV, MOV, FLV, RM, RMVB, etc, with powerful video decoder built in. It also supports iPod classic, iPod touch, iPod nano, iPad/3, Apple TV (HD). This program delivers an extremely easy solution for anyone seeking to enjoy their multimedia on Apple iPhone at anywhere, anytime. Completely compatible with all popular videos such as MKV, M2TS, MTS, MOD, AVI, MPEG, WMV, MOV, FLV, RM, RMVB, etc. Support iPhone (iPhone 3G, iPhone 3GS, iPhone 4, iPhone 4S, iPhone 5), iPad/3, iPod/5 and iTunes. Full-featured video software for your iPad/iPad 2/iPad 3 which owns strong compatibility with all popular videos and cutting-edge technology to ensure unrivaled output video quality. It is the best helper for you to convert HD video AVCHD (*.MTS, *.M2TS), H.264/MPEG-4 AVC, MKV to iPad as well as regular video MPEG, WMV, FLV, 3GP, AVI to iPad/3, etc. Maximize the usage of your mobile phone now! Enjoy your favorite videos on Nokia, Blackberry, Android phone, iPhone/5, etc, regardless of video format. Convert HD-camcorder video MOD, MTS, M2TS, TOD, HD video MKV, AVCHD, H.264/MPEG-4 AVC, regular video AVI, MPEG, WMV, FLV, DivX, XviD, MOV and VOB for playback on your cell phones. This program delivers an extremely easy solution for anyone seeking to enjoy their multimedia on Apple iPhone at anywhere, anytime. Completely compatible with all popular videos such as MKV, M2TS, MTS, MOD, AVI, MPEG, WMV, MOV, FLV, RM, RMVB, etc. Support iPhone (iPhone 3G, iPhone 3GS, iPhone 4, iPhone 4S, iPhone 5), iPod/5, iPad/3 and iTunes. Professional and innovative ringtone making program for iPhone (iPhone 3G, iPhone 3GS, iPhone 4, iPhone 4S) users to own make their iPhone ringtone from beloved music. Personalizing ringtone by adding fade-in and fade-out effects, customizing ringtone duration, as well as, getting rid of the high and low distorted audio. Smoothly play Blu-ray DVD movies on iPad/iPad 2/iPad 3/Mini with this smart Blu-ray DVD iPad ripper software. It brings you uncompromised Blu-ray DVD ripping speed by fully supporting Multi-core CPU with advanced Blu-ray DVD decrypting system built in. Moreover, iPhone/5, iPod/5, Apple TV are also supported - versatile application for Apple fans and Blu-ray DVD movie fans. The name says it! This software is specially designed for ripping DVD to iPad/iPad 2/iPad 3 under Mac OS so that you can watch DVD movies on iPad without limitation, no matter limitation on format compatibility or copy protection. It benefits users by unbeatable DVD ripping speed, top output quality and easiness. It also supports iPhone/5, iPod/5 and Apple TV. Full-featured video software for your iPad/iPad 2/iPad 3 which owns strong compatibility with all popular videos and cutting-edge technology to ensure unrivaled output video quality. It is the best helper for you to convert HD video AVCHD (*.MTS, *.M2TS), H.264/MPEG-4 AVC, MKV to iPad/3 as well as regular video MPEG, WMV, FLV, 3GP, AVI to iPad, etc. Include Digiarty's seven best selling software - DVD Ripper Platinum, HD Video Converter Deluxe, DAPlayer, DVD Copy Pro, iPhone Ringtone Maker, Bluray DVD iPhone Ripper and iPhone Video Converter. All-in-one solution to play Blu-ray/DVD/HD videos, rip/copy DVD, convert HD/regular videos, create iPhone ringtone and watch Blu-ray, DVD, MKV, M2TS, AVI, WMV on iPhone, iPad. Three software are bundled into this pack to fully organize your media files - WinX DVD Ripper Platinum, WinX DVD Copy Pro and WinX HD Video Converter Deluxe. It offers an ultimate solution to rip DVD to AVI/MP4/iPhone/iPad/Android, clone DVD to DVD/ISO image, and convert HD/regular videos. All features maximally upgrade your multimedia experience. Pack with WinX DVD Ripper Platinum and WinX HD Video Converter Deluxe. Getting this pack means you will have high quality DVD ripper, DVD burner, HD video converter and Youtube online video downloader. The built in revolutionary technologies give you blazingly fast DVD/video converting speed and optimum image/sound quality. This pack contain DVD Ripper and HD Video Converter designed for Mac OS X, Apple iPhone/5, iPad/3/Mini, iPod/5, iTunes, Apple TV, Surface, QuickTime Player, iMovie, iLife, PSP, Zune, Zen, Mobile phone, etc. Rip protected DVD and convert MKV, AVCHD, M2TS, AVI, WMV, FLV, 3GP, RM, RMVB, Youtube videos to fit your diverse video players, video editing tools. Two software are included, WinX DVD Ripper Platinum & WinX DVD Copy Pro. Prepared for DVD fans to decrypt & backup DVD to DVD disc, DVD to ISO image, DVD to a single MPEG files and copy DVD chapter, etc. Plus rip DVD/DVD ISO image to AVI, MP4, FLV, WMV, 3GP, iPhone/5, iPad/3/Mini, iPod/5, Apple TV, Surface, PSP, etc, backup DVD to hard drive & USB. This pack consists of WinX HD Video Converter Deluxe and WinX DVD Author. Save your favorite video collections to DVD, no matter they are HD videos MKV, AVCHD, MTS, M2TS, MOD, TS, or regular videos AVI, MP4, MPEG, WMV, MOV, FLV. The converter software also lets you convert video to iPhone/5, iPad/3, iPod/5, PSP, PS3, Xbox, Mobile phone, etc. This pack combines WinX Blu-ray DVD iPhone Ripper and WinX iPhone Video Converter. These two utilities eliminate the frustration of iPhone video conversion by assisting users to flawlessly rip Blu-ray DVDs to iPhone, convert videos MKV, M2TS, AVCHD, MOD, TS, AVI, MPEG, MOV, FLV, 3GP, etc, to iPhone (iPhone 3G, iPhone 3GS, iPhone 4, iPhone 4S, iPhone 5). This pack, including WinX Bluray DVD iPad Ripper and WinX iPad Video Converter, has all the features to rip Blu-ray DVD and convert videos ready for use on Apple iPad/iPad 3/iPad Mini. Thus, no matter homemade DVD or encrypted DVD, HD video MKV, MTS, AVCHD, MOD, TOD or regular video AVI, MPEG, WMV, FLV, RM, RMVB, all media files can be smoothly played on iPad/3/Mini.